awarded to Chief Mechanic (Observer) T. Bennett, Royal Air Force, late Royal Flying Corps, whose marksmanship accounted for at least one enemy aircraft - an artist?s impression of which combat later appeared in an illustrated history of the War - prior to being severely wounded in a subsequent combat in October 1915, when hit by the nose of shell which fractured his arm: Distinguished Conduct Medal, G.V.R. (448 Cpl. T. Bennett, R.F.C. ), in fitted, velvet-lined case, very fine. 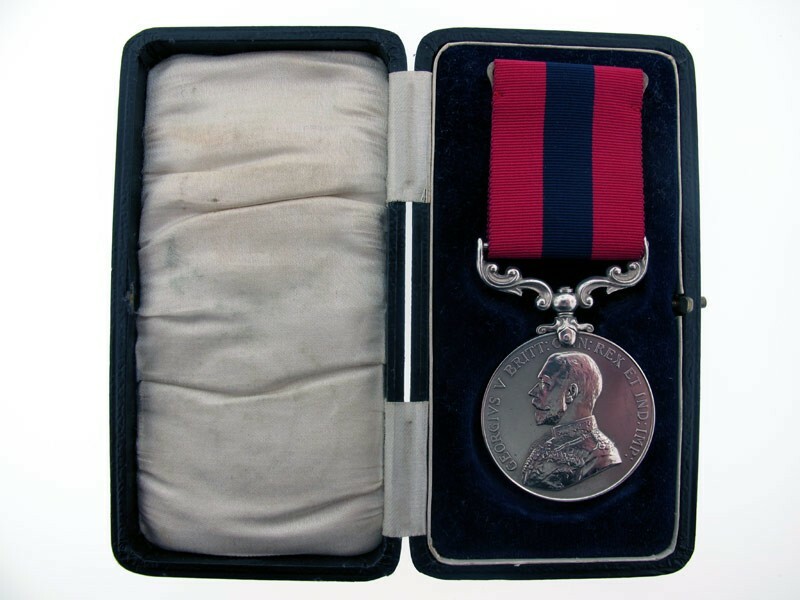 One of just 33 Distinguished Conduct Medals awarded for air operations to members of the Royal Flying Corps, out of a total of 92 awards.D.C.M. London Gazette 9 October 1915:?For conspicuous bravery and skill on 13 September 1915, over Bois de Biez. While on patrol duty, with 2nd Lieutenant H. S. Shield, at an elevation of about 10,000 feet, a German Albatross was sighted. The Officer dived towards it, and engaged it at about 7000 feet. While diving they were subjected to heavy anti-aircraft gun fire. The Germans used during the engagement a machine-gun very conveniently mounted, but Corporal Bennett handled his gun with great coolness and skill, and succeeded in disabling the German machine, which side-slipped, nose-dived, and came to ground in our lines. ?Thomas Bennett enlisted in the Royal Flying Corps in October 1912 and had been advanced to 1st Class Air Mechanic by the time of his arrival in France with No. 2 Squadron on 13 August 1914. Transferring to No. 16 Squadron sometime thereafter, he commenced service as an Observer and quickly saw action:R.F.C. Communique dated 13 September 1915:?2nd Lieutenant Shield (Pilot) and Corporal Bennett (Observer) in a B.E. 2c with Lewis gun, when patrolling over Bois de Biez at 10,000 feet attacked an Albatros (small type) which was crossing over our lines towards Armentieries. While the Albatros was circling to re-cross the line, Corporal Bennett fired two drums into it from the mounting. The engine was hit and the hostile machine brought down. The Pilot, Leutnant Suwelack, 24th Flieger Abteilung, attached to XIXth (Saxon) Corps, and the Observer, Leutnant Oskar Teuchmann, 2nd Photographic Section, were both killed by bullets. The machine was undamaged except by bullets, was a new Albatros of the small type with 160 horse power Mercedes engine, its number was C 60/5, maker?s mark 853. There was a machine-gun unit on a good type mounting, admitting of all round fire. Three cameras were found in the plane. ?Bennett was awarded the D.C.M. and 2nd Lieutenant Shield the M.C. ; an artist?s impression of the action was later reproduced in World War One in Pictures, under "Some Deeds of Daring That Won the D.C.M." (copy included).R.F.C. Communique dated 28 September 1915:?2nd Lieutenant H. S. Shields (Pilot) and Corporal Bennett (Observer), of 16 Squadron, in a B.E. 2c with Lewis gun, when on reconnaissance north-east of Wavrin at 7.05 a.m., observed a small Albatros with machine-gun in the back seat approaching from Lille. Lieutenant Shields turned to meet this machine. The two aeroplanes passed each other at point blank range, so close that the faces of the German Pilot and Observer could be distinguished. Some rounds were fired at this range, after which the hostile machine dived almost vertically and continuing machine-gun fire until out of range. When at very low altitude clouds of smoke came from the engine, but the machine recovered sufficiently to fly back to Lille.?R.F.C. Communique dated 22 October 1915:?Lieutenant Greenwood and Corporal Bennett, of 16 Squadron, in a B.E. 2c, encountered an Albatros in the vicinity of Don. The German fired a white light upon which the anti-aircraft gun fire ceased and the hostile machine then opened fire with his machine-gun. Lieutenant Greenwood turned to meet the German and returned his fire. The enemy at once dived steeply making off eastwards. On re-crossing the lines near Bois Grenier, Lieutenant Greenwood?s machine was hit by a shell, the Observer being wounded in the elbow. ?The C.O. of No. 16 Squadron, Major H. Dowding (afterwards Air Chief Marshal Sir Hugh of Battle of Britain fame) afterwards submitted his own report in the respect of the above cited combat, the latter part of which states:?After crossing the lines by Bois Grenier on his homeward way, Lieutenant Greenwood?s machine was hit by a shell, the explosion of which he did not hear, although he had his engine throttled down. The Observer, Corporal Bennett, was hit in the elbow by the nose of the shell and suffered a bad compound fracture of the arm. The engine stopped. The Pilot made a safe landing in a field near the canal, close to Croix du Bac, and saw that Corporal Bennett, who had lost a lot of blood, was made as comfortable as possible under the circumstances. ?Admitted to hospital, Bennett was evacuated to the U.K. in the following month, having been advanced to Sergeant Observer on the day that he was wounded. He became a Flight Sergeant in April 1917 and, on the formation of the Royal Air Force, a Chief Mechanic (Observer). He was finally discharged in January 1920, as a result of ongoing complications with his wounds.